The cosy and lining is worked in one piece, then folded in on itself to create the lining. Using the 5 mm double-pointed needles and 8 ply yarn in dusty olive green, cast on 80 stitches — 20, 20, 20, 20 on each needle. Join in a round as follows, making sure the stitches are not twisted around the needles. Rounds 1–4: *K2, P2*, repeat * to * to end. Row 5: Turn the work so that the wrong side is facing you. Work 40 stitches, continuing the rib pattern (P2, K2), across two needles. Row 6: Turn the work so that the right side is facing you. Continue the rib pattern (K2, P2). Rows 7–24 : Repeat rows five and six for 18 more rows. Break off the yarn, leaving a long tail for darning later. Repeat rows 5–25 with the remaining stitches on the other two needles. Do not break off the yarn. Row 25: Join the sides together again by knitting in the round once again. Continue working the rib pattern (K2, P2) for 30 more rounds. Repeat rows 5–24 as above. Repeat rounds 1–4. Cast off. Make eight red roses and one pink rose. Cast on 25 stitches. Rib for 5 rows. Next Row: Increase into every stitch (50 stitches. P1K1, P1K1, purl to last four stitches, K1P1, K1P1. Next row: K1P1, K1P1, knit to last four stitches, P1K1, P1K1. Repeat these 2 rows 10 times. Cast off. Twirl so that wrong side of stocking stitch shows. English and Australian crocheters have a different crochet language to you. We won't hold it against you luvvies but this table might help a bit. Using a 4 mm crochet hook and 8 ply yarn make 39 chain. The pattern works in multiples of four stitches. Row 1: Skip the first 2 ch (counts as first dc) and make 1htr into the third chain from the hook, 1 htr into next 2 ch. 1 dc into next dc. *1 htr into next 3 ch, 1 dc into next ch*, repeat * to * to end. Row 2: 2 ch (counts as first dc), *2 tr into next 3 htr, 1 dc into next dc*, repeat * to * to end. Row 3: 2 ch (counts as first dc), *1 dc into next 6 tr, 1 dc into dc of first row*, repeat * to * to end. Tie off and cut the yarn, leaving a long thread at the beginning and end of the pattern. Twist the work round and round so that the petals fold outwards from the centre. Sew together the base of the rose to secure the shape. Using a 4 mm crochet hook and 8 ply yarn, make eight chain. Join the chain into a ring by working a slip stitch into the first chain. Round 1: 2 ch (counts as first dc), work 11 dc into the ring gathering up the tail of the yarn as you go (12 stitches). Round 2 and each alternate round: 1 dc into each dc to end. Round 3: 2 dc into each dc to end. Round 5: *2 dc into next dc, 1 dc into next dc*, repeat * to * to end. Round 7: *2 dc into next dc, 1 dc into next 2 dc*, repeat * to * to end. Round 9: *2 dc into next dc, 1 dc into next 3 dc*, repeat * to * to end.Round 11: *2 dc into next dc, 1 dc into next 4 dc*, repeat * to * to end. Fold the tea cosy sock in on itself, aligning the openings for the spout and handle. Sew the lining and the outer sock together at the edges of the spout opening and handle opening. 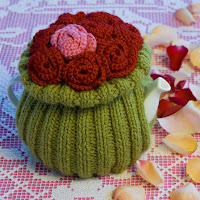 Place the tea cosy over the teapot with the folded edge at the top. Pin a rose bed approximately 3 cm (or best fit) from the top of the fold. Sew the bed into position, securing it to both the inner and outer sock walls. 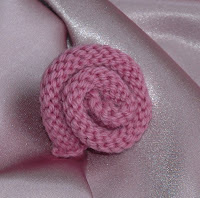 Arrange the roses on the bed with the pink rose in the centre and sew each item securely into place. Turn the tea cosy inside out and darn the ends of the threads into the bottom of the tray. For a really professional look, sew the second rose bed into the inside top of the cosy to cover the darned threads.